NEW YORK CITY, December 1, 2017 – With the Andes Mountains as a stunning back drop, the inaugural GFNY Chile treated a sold out field of 1500 riders from 23 nations to a perfect day of riding. Host town of Casablanca and the region of Valle Central rolled out the red carpet to riders from around the world, ensuring maximum safe and enjoyable racing conditions. 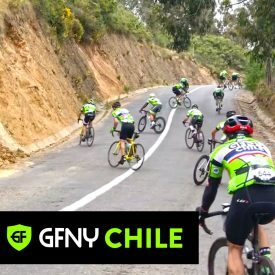 Proud Chileans were eager to take on the first GFNY Chile on their home soil and made up 70% of the field. Perfect racing conditions of late spring temperatures set the tone for a fast race right from the start with the lead peloton pushing a steady 41kph throughout the first third of the course. At KM 53 the leading peloton broke away leaving behind the rest of the field. The group contained Alejandro Alvarez, Diego Geldrez, Nestor Castillo, Rodrigo Vilches Alberto, Aramayo, Cristian Mancilla and Gonzalo Schmeid. The route posed many challenging climbs along the way but paled in comparison to ‘El Muro de Tunquen’ also known as ‘The Wall’. Here riders met with a steep climb of up to 37% maximum grade. Here the toughest climbers lay down the pace and whittled the peloton down. Mancilla made a breakaway and gained a 20metre advantage but his push was too much too soon. His chain broke leaving him out of the race. Alvarez and Castillo took over the lead and imposed their pace to filter the group to three including Schmeid. Alvarez held onto the lead pushing the pace from KM130 all the way to the end and took the win across the line at Viña Veramonte in a time of 4:11:23. Schmeid followed him home in 4:14:29, with Castillo rounding out the podium in 4:16:11. Constanza Martinez dominated the women’s race taking the win in a time of 4:29:00. Elisa Jarmillo crossed the line in second over twenty minutes back and third taken by Macarena Garay in 4:54:21. The top 10% of finishers in each age group in the long route qualified for the racer corral at the Campagnolo GFNY World Championship in New York City next May 20, 2018.